KATHMANDU, June 21: The stock market showed a lack of direction for the first trading hour on Wednesday's trading. However, the benchmark equity index declined throughout the latter session to close over 8 points lower for the second day straight. The Nepal Stock Exchange (Nepse) Index ended the day at 1,217.84 points. The slide experienced by the index mainly signifies the continuation of the downtrend the market has been experiencing since the last two months. Subsequently, the market has reached its lowest point of the aforementioned period. The drop of the market is also partly driven by the absence of any meaningful event on the economic front.Nonetheless, market activity showed a slight improvement as a total turnover of Rs. 273 million was posted in the exchange, compared to the preceding day's turnover of Rs. 208 million. Most of the major sectors ended the day lower except the trading sub-group which finished flat. Hydropower stocks witnessed substantial weakness as reflected by a 1.35 percent drop in its sub-index. Others Sub-Index also fell over 1.1 percent on the day. Moreover, the sub-indices of Insurance, Microfinance and Banking shed over 0.6 percent a piece.Among the active stocks, shares of Om Development Bank Ltd logged in the highest turnover of more than Rs. 36 million. Further, Mega Bank Ltd's scrips recorded total transactions of Rs. 27 million. Other top turnover stocks for the day were Nepal Bank Ltd and Chhimek Laghubitta Bikas Bank Ltd. Samata Microfinance Bittiya Sanstha Ltd was also active for the day. 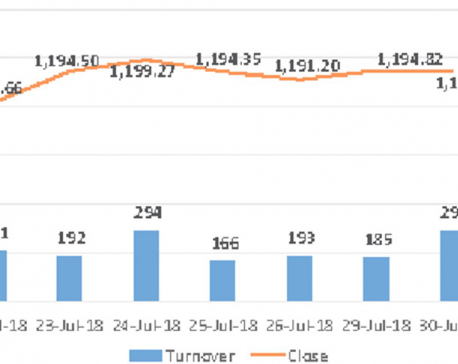 The company has announced its book closure date for its issue of 50 percent right shares on Jun 26.Everest Bank Ltd Convertible Preference Share led the list of advancing stocks with a rise of about 4 percent. Shares of Excel Development Bank Ltd, Samata Microfinance Bittiya Sanstha Ltd and Janautthan Samudayic Laghubitta Bikas Bank Ltd were the other top gainers for the day.Conversely, stocks of United Modi Hydropower Ltd, Unnati Microfinance Bittiya Sanstha Ltd and Radhi Bidyut Company Ltd were under pressure on Wednesday as their prices dropped around 4 percent. Mega Bank Ltd's stocks also experienced a loss of 3.87 percent.In the corporate news, Pokhara Finance Ltd has announced 8.69 percent bonus shares to its shareholders after which the finance company will meet the capital requirement of Rs. 800 million. Furthermore, Deva Bikas Bank Ltd has called for its Annual General Meeting (AGM) on July 11. Distribution of 17.10 percent bonus share is one of the main agenda for the meeting.ARKS technical analysis model presents a bearish candle formation for the second consecutive day. This shows that the index has failed to find any support at the current range and, hence, is continuing its drop towards the 1,200 points mark.